Inspectioneering received responses from a wide array of facility types (the majority being oil refineries) located on all six of the inhabited continents. 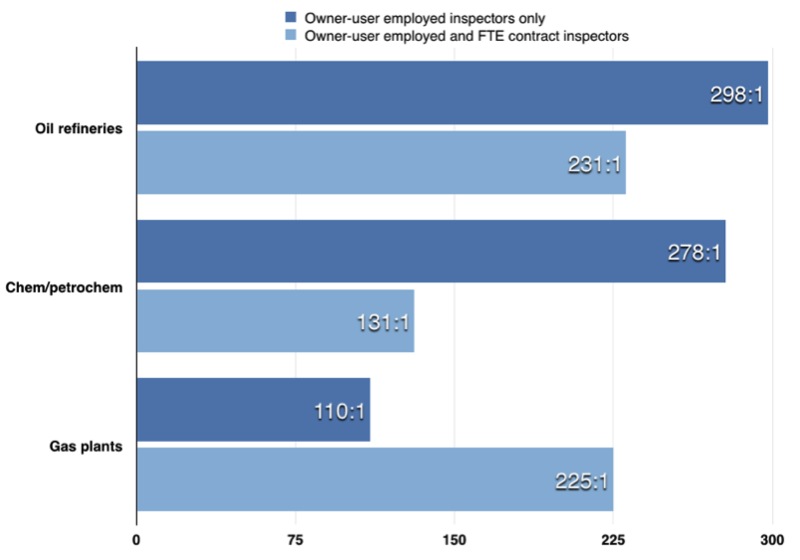 In total, facilities reported 832 inspectors responsible for just over 143,000 pressure vessels. The following chart shows the results of the survey. The chart is divided into three different facility types. Each facility type shows two different ratios: (1) the ratio of code-stamped pressure vessels to only owner-user employed inspectors, and (2) the ratio of code-stamped pressure vessels to both owner-user employed and full-time equivalent contract inspectors. In the near future, Inspectioneering will be publishing an article providing further detail and analysis. Furthermore, we intend to run this survey and others on a periodic basis in the future to help keep track of industry trends and provide benchmarks for our readers to use to improve their facilities. Need more info...maybe an up to date survey Log in or register to read the rest of this comment.